Brian Charette brings a modern sensibility to the Hammond B-3 organ, especially with his experimental trio Kurrent, in which he incorporates synthesizers. But his new album with the legendary saxophonist George Coleman is a complete throwback. It’s a 1960s-style blowing session that recalls titans like Jack McDuff and Jimmy McGriff. The quartet includes Coleman’s son George Coleman Jr. on drums and guitarist Vic Juris. Charette and the younger Coleman have been friends for almost three decades, but the organist didn’t gig with Coleman senior until just a couple of years ago. That alliance led to this fantastic album. 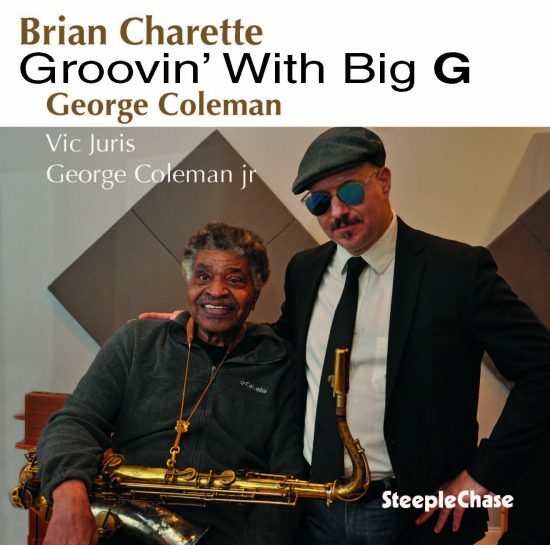 Groovin’ With Big G is old-school organ jazz right down to the selections: eight classics plus one Charette original. Eight bars of Charette’s unaccompanied greasiness launch “Stella by Starlight” before Coleman blows romantic lines over a swinging rhythm; Charette’s dexterous solo manages to quote both “Autumn Leaves” and “Santa Claus Is Coming to Town.” Coleman—82 when this was recorded—retains his strong, fluid tone, notably on a beautiful “Body and Soul,” and turns in a few crazy runs, such as the flurry of triplets over “On a Misty Night.” Yet his soloing on “Never Let Me Go” is so tender you want to cry. The quartet demonstrates how diverse organ/sax jazz can be: a faithfully funky run through Lou Donaldson’s staple “Alligator Boogaloo”; a languid and dreamy take on Herbie Hancock’s “Maiden Voyage” (rarely heard with organ); a 10-minute stroll through “Autumn Leaves”; a racing “Tenor Madness.” Charette’s fine original, a slow blues called “Father and Son,” fits right in, because it sounds of the ’60s. Preview, buy or download Groovin’ With Big G on Amazon!